Now ignore that because your eyes feel like they’re going to explode, you’re pretty sure someone has split your head open with an axe, you’re too nauseous to move, and your body feels like you’ve run a marathon and then been hit by a Mac truck. The pain is too intense to move or speak, but your speech is too slurred for anyone to understand you anyway. Add to that vomiting, blurred or lost vision, hyperacusis, physical hallucinations, and many more odd side effects. The hangover is irrelevant. Hi! I’m Kate and I have chronic migraines. I always feel like such a drama queen when I describe my migraines, which is why I don’t usually tell people what they’re like. It’s hard to explain feeling like you’re dying, but also knowing you’ll be okay and just have to endure it. I also don’t want anyone to feel bad for me, or pity me. I’ve had migraines my entire life, so I don’t know what life would be like without them. This is what a mild migraine looks like for me (the purple thing is twopounds of frozen wheat, aka my frozen pillow, aka my frillow). 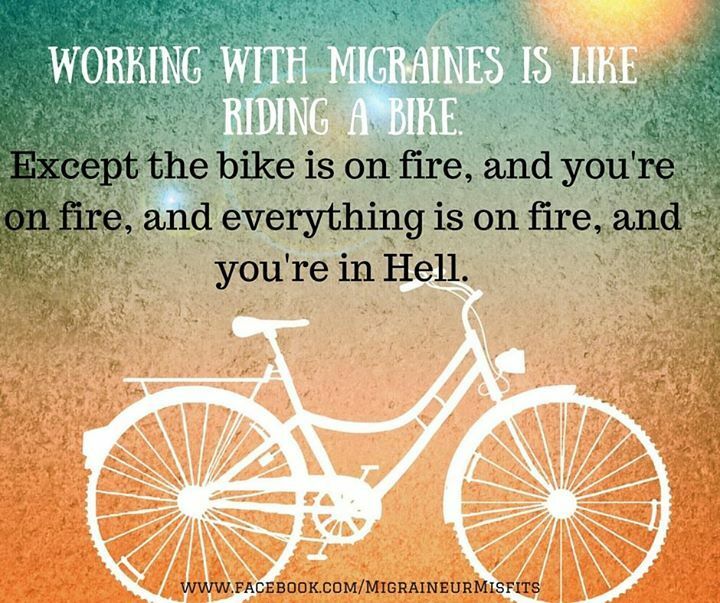 Although I’ve had them my entire life, I thought my migraines were something that I should grit my teeth and get through. I didn’t reach out for help until three years ago, when my friend C changed my life. C started getting migraines for the first time and asked me to meet her for tea (caffeine free of course). We chatted, C told me about her migraines, and I sympathised and gave her what I thought was sage advise for powering through them. At one point during this conversation C said “I don’t want to live like this! There has to be something else I can do.” It’s such an obvious statement, but it hadn’t occurred to me that I could ask for help. This set me on a journey, I figured out my family doctor had no idea what he was talking about through my own research, but took his advice to see a therapist (hot tip: therapy doesn’t cure migraines). My amazing therapist WAS able to get me a new family doctor, who got me to see my current neurologist & psychiatrist at the Centre for Headache. It took until very recently for them to get me on medication(s) that work to both prevent migraines and abort them before they get as awful as described above. I still get 2-6 migraines a week on average, but my pain levels have been steadily decreasing (yay! ), and I can function at an almost normal level. Most people can’t tell when I have a migraine, which is nice sometimes, but can also be awful when people don’t believe you’re in pain. Invisible illnesses make things weird sometimes. I’m still making life changes, like working exercise back into my life and maintaining a good (work/)life balance, and minimizing my illness less. But I am so happy and grateful that my life has already improved as much as it has.